The purpose of the Quality Standards is to describe high levels of “Quality” of a program at the programmatic, staff, and participant levels. View this video to further understand what the Quality Standards are and why they are important. It highlights how the Quality Standards can be used for continuous quality improvement in your program. 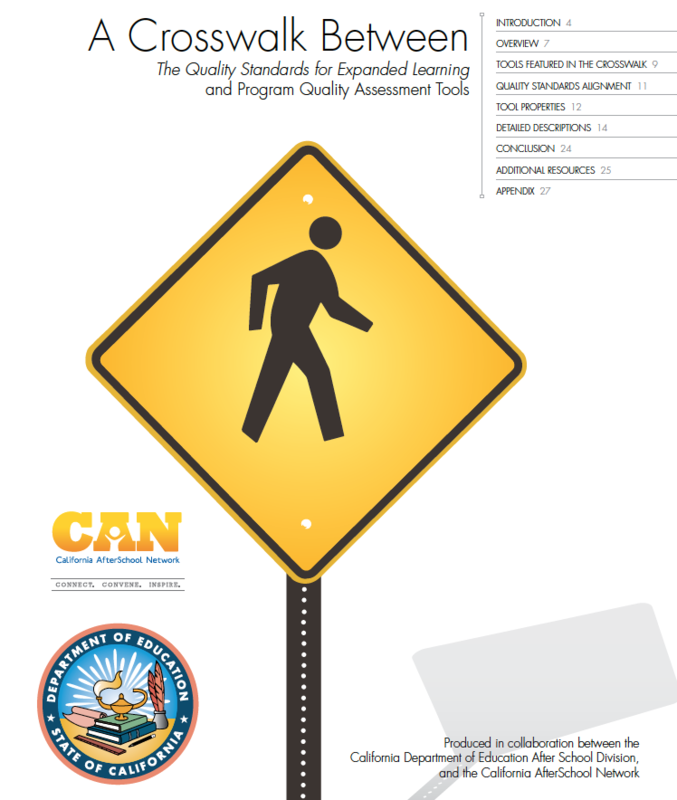 This report, part of the second phase of the Quality Standards project, crosswalks the Quality Standards with existing quality assessment tools. This guide is a resource for programs considering different assessment tools; there is no requirement to use the tools in this guide. California Afterschool Network's Campaign for Quality seeks to connect after school practitioners to research-supported promising practices grounded in field experience. Below, you will find both tools and promising practices. The Campaign for Quality tools are developed by practitioners from the field, in partnership with CDE, to help programs assess and improve overall program quality. The promising practices are companions to the QSA Tools, and were created as the next step following self-assessment. The California Afterschool Network is working hard to bring you the resources you need to strengthen or implement your high quality STEM program, and the STEM Quality Elements is a resource currently being worked on now that should be available in the coming months so look out for it! It can be used with other tools in assisting program leaders and facilitators to plan for quality in their STEM efforts. The Youth Program Quality Assessment (PQA), School-Age Program Quality Assessment and several extensions (STEM, Arts, Academic Climate, Health and Wellness) were designed to assess the quality of learning environments and to identify staff training needs.